That question needs to be asked because if we aren’t ready, we have to get ready – only then can we stay ready – because the change is coming! Things have changed, and accountants and finance professionals don’t have to crunch the numbers – we have to communicate information to the end user, listen to what they are saying, and learn to have a dialog again. We have to be continuous learners and continue to develop ourselves. Because if we’re not continuing to educate ourselves, we’re leaving ourselves vulnerable to the disruption that technology will introduce. Peter: [00:00:00] Welcome to Episode 3 and my guest today is Eddie Turner. And I tell you what, he has a very impressive bio. He is a C suite network adviser, international certified coach, a certified trainer, a professional speaker, President for the Association for Talent Development’s Houston chapter, an Ambassador coach for the National Speakers Association. He’s an alumnus of Northwestern University and the John F. Kennedy School of Government at Harvard University. And finally, an adaptive leadership practitioner and part of the Adaptive Leadership Network. Now with that said, I’m going let any tell you more about his business from a video that he has on his Web site at www.EddieTurnerLLC.com. Eddie: [00:00:50] Hello I’m Eddie Turner and I am a change agent. I help organizations and individuals lead change, and I do that in three primary areas. The first area is through the use of the power of the spoken word, and I do that through professional speaking, as I did here in the beautiful city of Taipei, Taiwan just yesterday. Another area is through executive coaching. Through executive coaching, I work with individual leaders to help them accelerate their performance and reach their desired level of change and provide their careers. I help organizations through the power of facilitation. Through facilitation, I work with organizations either virtually or face-to-face, around the globe, to work with executive planning, to do strategic workshops. I help individuals get a competitive advantage, surfacing the best ideas in their organization. Leading change in a business imperative. Peter: [00:01:59] So without further ado, let’s get to the interview with Eddie Turner. Hey welcome back everybody. I am so honored to have Eddie Turner on my podcast today. Eddie and I this is the first time we’ve actually met. We have a mutual friend Bob Dean who’s been sharing information to me about Eddie and vice versa. And first and foremost, Eddie thank you for taking time I was schedule to be on my podcast. Eddie: [00:02:28] Well Peter thank you for having me here on your podcast. What a pleasure to be with you. Peter: [00:02:33] Oh it’s a pleasure being with you. May I say you have a radio voice. Eddie: [00:02:40] You’re awfully kind. Thank you Peter. Peter: [00:02:42] I’ve been told I have a radio face versus a radio voice. But that’s a whole different thing. Eddie: [00:02:47] Not at all. You are doing great work. I enjoy listening to your podcast, tuning and and just hearing your perspective. To be included now among the long list of fantastic guests that you have had is quite a privilege. Peter: [00:03:02] Thank you so very much and I’m looking forward to our conversation because we speak the same language in a lot of ways, just in a different a different angle. So let’s start by– if you can give the audience a little bit about your background. Who is Eddie Turner and what do you do? Eddie: [00:03:18] I work with leaders to accelerate performance and drive impact. And I do that primarily in three ways. Number one I’d say it’s through executive or leadership coaching and I do that primarily one on one. But there I larger groups where I used the power of facilitation to help groups with issue resolution, process mapping, strategy planning, and many other needs that happen in corporations. So facilitation. Also I don’t do training. I do facilitation, in the sense that when it comes to learning delivery, it’s not a a monologue but a dialogue with my learners. And finally, I give professional speeches or key notes. Peter: [00:04:06] I liked that. I don’t do a monologue. I do a dialogue. And I love that concept because I’m a firm believer that whatever audience you’re in front of, whether it’s one on one or a thousand, to provide that conversation experience is key in getting your message across. Eddie: [00:04:25] Absolutely, especially in a in a space of learning. But I think even more so what speakers are finding is no longer do audiences show up to listen to the sage on the stage. They show up to have a conversation, to have a dialogue, even with a keynote speaker. Peter: [00:04:44] Exactly. And and I think that’s driven some by technology, but I think it’s driven for the thirst of knowledge. And a lot of times if we’re not engaging and createing a conversation on the platform, whatever that platform may be, we begin to lose our audience they begin to tune out. And as I like to say that they begin the conference prayer which is which is they bow their heads and look at their smartphones. Eddie: [00:05:14] Well you’re absolutely right. It is it is driven by the combination of both technology and the abundance of knowledge, which technology is giving everyone access to. So when they show up they already have a access to Google. They have access to online learning, and as you mentioned, they have their smartphone in their hand. So they are not showing up to learn new things from us. They want to be as you say in your bio, which I love, edutained. So tell me if you come up something new, share that with me, but now entertain me in the delivery – but more importantly, I am a professional who has experience and has knowledge of my own. Involve me. Include me as a part of this delivery. Peter: [00:06:00] And in doing so, we must always know our audience. We must always have them in mind throughout the process of developing anything because if I don’t make that connection, I need to speak their language. I need to put things in context that they can understand, not what I have but what they need. Peter: [00:06:22] So you help leaders, you help leaders become more effective, more more– and you do this through coaching and through facilitation. And since we both know Bob Dean, and Bob is a big collaborator and I heard you on another podcast talk about facilitated collaboration. Can you define that? Eddie: [00:06:43] Yes indeed. So Bob Dean is in fact someone who I owe a great debt of gratitude to. He’s one of my mentors. He’s someone I met when I decided to go back and finish my undergraduate degree as an adult. He is one of the first people I’ve met who came to speak to our class. It’s how we MET. And I was really just impressive what he had to say and I followed up with a thank you note to him and he followed up by inviting me to coffee. And I thought wow that’s awfully nice of him. That coffee invitation has turned into I think now a 12-year friendship. And we’ve been business partners, we’ve been colleagues, but we’ve also been collaborators. And so this idea of facilitated collaboration is the title of the book that I have yet to finish, but forthcoming. But it turned into a book because we talked about the idea that he and I are from two different spectrums. There’s a there’s a big difference in terms of who we are, our personal narratives, our professional narratives. And we you see Bob and I, we are probably the two least likely people you’d expect to see show up in a room but we’re the best of friends, we have a great relationship, and our uniqueness has turned into some of the best work of both of our professional lives. It was through that collaboration, and facilitation was at the heart of it. And so it became something that we’ve deployed inside of organizations. And so we think that collaboration is a buzz word in business today. Everyone talks about it. But how do you do it? And we think that the secret sauce is that it should be facilitated – facilitated collaboration is what accelerates performance and drives impact. Peter: [00:08:33] So I 100 percent agree. I love the I love the concept facilitated collaboration and I love collaborating. But as I think about this and I think about leaders, I think one of the the the barriers in collaboration is those unconscious biases that we have. How do you get leaders to recognize these biases and manage around them so they can collaborate? Eddie: [00:09:01] Interestingly, that’s where the coach in me really becomes a benefit when working with leaders. Even if I’m not working with a leader specifically as their coach, the coach in me helps on unearth unconscious biases by challenging their thinking and creating a new consciousness through the use of powerful questions. Now sometimes that happens in the one on one interactions in a consulting relationship. At other times, it may happen as the facilitator. In both scenarios, the goal is to allow the leader to come to their own conclusion through the use of powerful questions. As opposed to me telling them the answer, allowing them to provide the answer on their own. Peter: [00:09:47] Tell me about the types of questions, how you get these leaders to recognize that they have biases and in helping to change their thought process. Eddie: [00:09:58] Well that’s a good question. Peter. I can tell you that my original background in business was through technology. I spent almost 20 years as an information technology professional before moving into coaching and facilitation and leadership development. And interestingly, a lot of my knowledge technology career was spent working with executives. So I have a mindset about technology and how business moves at the speed of technology, but also how executives are looking at things. And so with several of my clients, I have had the opportunity to not only approach them and challenge their thinking existing thinking about their business, from a technology perspective, but also from a leadership perspective. How should senior leaders and executives be looking at these items? So for example, it’s not often that I run into a situation where individuals say this is the way we’ve always done it. Peter: [00:10:59] Ah. It kills me when I hear that. Eddie: [00:11:03] It’s a trite statement but it comes up so often, and it’s almost scary how often people say those exact words. This is the way we’ve always done it, or people don’t see a need for change. There is a resistance to change. So asking probing questions about the issue at hand. I’m thinking of one in particular about the way a corporation does something as simple as holding meetings. They’ve always held face to face meetings. And in this scenario, this fortune 300 Corporation in the energy services field, when the Energy Services took a downturn as a whole as an industry, the way we’ve always done it no longer was going to work. So I received an e-mail invitation inviting me to a meeting, and when I looked at the invitation it wasn’t the normal invitation that I have ever received. This invitation was from the CEO. And I looked at that again I thought Is it some mistake? So I inquired of my my manager at that time and he said no it’s not a mistake. He’s asked me about it, he wants to meet with you. And so I reach out and response of course I’ll be there, and he was very kind, Peter He actually asked me Are you available at such and such and such date such time, and I thought yeah I can clear out from time on my schedule for that. So I show up to the meeting with the CEO and another senior leader,m one of his top leaders who ran one of the major divisions of the corporation And he explained to me that he had heard about my work and he was faced with a dilemma, and the dilemma was that there are four major meetings run in a corporation every year called the quarterly business review. And he was faced with having to reduce the four major meetings, the four most important meetings of the business, down to two because it was no longer sustainable to keep flying all the executives around the globe for a face to face meeting four times a year. Now I don’t know about you Peter but I don’t really travel like they travel, so it does get– it does cost a little bit more. Eddie: [00:13:27] And so I said Yes I can support you by doing things a little different. We can hold those same important meetings not face to face but virtually. And of course when people think virtual they think let’s hold a WebEx session. Eddie: [00:13:43] I love WebEx. It’s a good product, good company, but it has gained a certain… people have a certain bias as you would say, a certain unconscious bias. Eddie: [00:13:54] So I got introduced a new way of running a highly facilitated collaborative executive meetings, and we saved the most important meeting of the business. They would now hold that meeting two times a year face to face and then two times a year virtually, and in the end, it was documented that by doing that, every time I held that meeting virtually for the executive team for the top 30 executives around the globe, I saved the corporation five hundred thousand dollars. Eddie: [00:14:28] Put another way, we saved a million dollars for the corporation. Put another way, we allow the business to save jobs and to remain sustainable. Redirecting those necessary funds to other aspects of the business, and we allow the executives to continue the work on the corporation to the benefit of the shareholders and not have to sacrifice what they needed to accomplish for the benefit of everyone. Peter: [00:14:58] Are you at liberty to share what type of platform you were using in order to facilitate these virtual sessions? Eddie: [00:15:07] Absolutely. So I use the protocol Adobe Connect, and so here again was another example of doing things a different, not using what we’ve always used. And so when you go to the department you say listen, I want to introduce a new product, all the I.T. people look at you with a scowl their face. So here’s where my I.T. background became a true asset to me because I could have the conversations with the I.T. professionals and with the CIO and talk about why I needed this particular product and how I would use it, and not put an extra burden on the infrastructure. And so by putting this platform in place, I also was able to brand the channel that I was using to deliver this service. And so I literally branded the webex solution as the self-service solution that everyone in the corporation would use. I wasn’t to take that away or change that. I wanted to keep it in existence do what it was doing. But here’s a new product that I wanted to use. I branded the channel as the facilitated collaboration network, and we would hold those meetings on there. And then we would go on to what other major meetings in the corporation. I ran a webinar at lunchtime to have all the experts across the corporation around the globe to tell their story about the things that they were seeing surface as customer concerns, trends in the industry, things that the newer engineers could benefit from. And also by the way, put that information to our knowledge base so the people can get that later or be able to retrieve it. We call that series experts explain, and it became a very popular series and it was hosted on the facilitated collaborative collaboration channel. And so show executive programs, the executive explain series, the ability to deliver high quality programming that was interactive, engaging, and yes collaborative – and extremely well designed. Here’s where a lot of the work that Bob and I put together really came into place because we branded it as about being the experience. Eddie: [00:17:18] Of course you know that Bob Dean is the second person in the world to be certified in the experience economy, the work of Joe Pine and Jim Gilmore. Eddie: [00:17:27] And so that factored in heavily to what we did. The design, the layout, everything. It was about what will be the employee experience. Peter: [00:17:37] Wow that is awesome. And as you’re describing this to me, brings me to today and the environment the business world is in today and thinking about my audience, who primarily are accountants, financial professionals. This disruption of technology… you know we’ve been talking about. But it’s now we’re seeing effects of it. It’s going to shake some things up and. And. What are your thoughts on the shakeup? What’s what’s the skill set that we need to begin to transform from the Excel spreadsheet, the you know the bean counter, in order for us to maintain our presence in the business world. Eddie: [00:18:28] Well Peter I believe that everyone, accountants, all of us in our professional lives, need to look and ask ourselves, when is the last time my industry innovated? And that question needs to be asked because if we as one gentleman said aren’t ready, we have to get ready. Stay ready so you don’t have to get ready – because the change is coming! We have to be continuous learners, continue to develop ourselves. I speak often at universities and corporations. And the interesting thing is some people never take a class after leaving a university. I know some people who don’t even pick up a book after leaving university. So if we’re not continuing to educate ourselves, we’re leaving ourselves vulnerable to the disruption that technology will introduce. Look at the largest hotel corporation in the world who owns no buildings – no hotel rooms at all. Eddie: [00:19:33] Airbnb. The largest taxi company if you will that doesn’t own a single car and doesn’t even provide a mobile phone for their employees or their drivers. Uber. Eddie: [00:19:45] Right. I saw a taxicab yesterday. He had a white sticker on his car that said I’ve been fingerprinted. Well he was so proud of that not because to say he’s a safe driver, but because this is one of the things that was forced upon a company like Uber. A lot of organizations have been fighting the Uber and Airbnb organizations, meaning the competitors and in some cases the city councils, to regulate these industries a different way. But really it’s a fear of change and a fear of their business model being disrupted, when in many cases, in the previous experience that some folks might have had is there they haven’t been in a clean cab, they didn’t know the cleaning cab is like. Eddie: [00:20:32] That they get in a personal vehicle, an Uber. It’s a it’s a clean ride, it actually smells nice, and the person says a greeting to you, and you know so it was a it was a disruption that that organization never saw. I listened to Michael Domínguez, one of the senior executives running one of the major chains there in Vegas, and he talks about how he’s always scanning the horizon. And he mentioned a very interesting story that I saw in passing, but until he talked about it I had locked in on this. He asked the question: What is the last time your grocery store innovated? And as we stop it make about it, it was probably the self-service checkout line that most of us avoid. Eddie: [00:21:18] Well Amazon – Amazon just purchased Whole Foods. Why would they buy a grocery store? Well for one they pay 13 billion dollars for it and the next day it went up to 16 billion. So they had a 3 billion dollar instant profit, but they are now experimenting with the fact that if you are an Amazon prime member, you literally walk in, select your items, and you walk out. Eddie: [00:21:47] They created a technology that is going to disrupt the grocery markets, supermarkets. I mean think about that. Peter: [00:21:57] It’s funny that you it it’s funny that you mention that because like local Kroger’s here and Westerville Ohio – I think they believe that they’re innovating because they’re turning it into these larger supermarkets, superstores. Peter: [00:22:12] But as you were describing this I’m like they’re not innovating, they just got bigger, but there’s nothing there’s really nothing different inside of it technologically. Eddie: [00:22:21] Absolutely. And so when we look at the taxicab market, when we look at the the hotel market or the rental market, and now look at grocery stores. It certainly is high time for all of us to ask ourselves the question: Am I next? Is my industry next? Well some of us may feel I’m safe. Computers, technology, it can’t do what I do. But I had a conversation with a dear friend of mine, she was the president at the time of the National Speakers Association in Pittsburgh. Her name was Sarah Cole. And Sarah is one of the nicest ladies you will ever meet Peter. But in addition to just being just a nice woman, she’s a pediatrician! And she was telling me how technology is changing her world. She said You can only look at web M.D. to get an example of how people are self diagnosing themselves, and then only come to the physician for a second opinion. Eddie: [00:23:22] So automated intelligence that we see in a rudimentary way through Web MD is actually taking over, starting to take over in the hospital world – and so much so that what they’re doing is, in some cases, instead of having multiple physicians on staff, you get multiple nurse practitioners and only one physician to supervise supervise them. But then also someone like her husband, who happens to be an ear nose and throat specialist, she said My time is almost up. He’s got about five more years. She said and then the robotics and the artificial told us will be so good it’s going to disrupt him. She used the example of what happened with the chess player whose name escapes me, but remember that the big IBM supercomputer?. Peter: [00:24:10] Yep yep yep. Eddie: [00:24:12] The Russian chess player was able to defeat. And it was it was just the remarkable thing. Right. Eddie: [00:24:19] But when you switch to artificial intelligence and this computer was able to learn on the fly, he was no longer able to beat that supercomputer. And that’s where we’re headed. So in every industry that we are part of, we need to get ready so we stay ready so we don’t have to get ready. We need to be continuous learners scanning the horizon looking to see where we can improve ourselves as individuals and staying ahead of the curve. Peter: [00:24:45] I thoroughly agree with everything you’ve said and and I think the biggest challenge for the accounting profession is to realize that Watson is here. Eddie: [00:24:55] That’s his name yes. Peter: [00:24:58] Watson is here. Watson is working now with the big four and the audit practice. Watson is here as we saw with the H+R Block commercials last year. Watson is that machine learning that is going to take away– I predicted a couple of years ago that excel at some point in time might become extinct because of artificial intelligence and you would’ve thought I dropped an f bomb in the room. People were apalled. Eddie: [00:25:25] Oh my gosh. Perish the thought. Peter: [00:25:27] Yeah well what am I going to do? But we moved– Well I can’t say that we’ve moved from a ten key to excel but I asked counting audiences how many of you still have your ten key and two thirds of the audience the hands still go up. Eddie: [00:25:42] Isn’t that something. Peter: [00:25:43] To me, they are still latching on to some old technology, but now that things have changed and I don’t have to crunch the numbers – I have to communicate information to the end user, and I think that’s where one of our biggest challenges arise. Eddie: [00:26:01] You’re absolutely right. And I laugh as you talk about the tenkey, Peter, because I was working with a dear millennial friend of mine just this week and we were working on a composition. We were collaborating. And I said something about the fact– she corrected me she said you should put two dashes there after the phrase, and I said well, that’s actually an em dash because a dash is a dash, but two together become an em dash because because it’s like the letter. And she says I’d never do that. I said Yeah because I had to take typing on a manual typewriter. I don’t want to talk about how old I am. On the ones that made noise. And if you made a mistake you had to actually use correction fluid and you threw the carriage wheel all the way over to the left hand side. So those little things you were forced to learn in the old typing days. Peter: [00:26:54] I just had a flashback just now. Thank you very much for that. Hahaha. Yes this environment has changed and is changing pretty dramatically, pretty quickly. And I think leadership– and when we talk about leadership, I don’t know if you agree with me on this comment, leadership has nothing to do with a title. Leadership is the way you have a positive effect on another individual. Eddie: [00:27:27] I agree with that fully Peter. In fact, we might say that we can summarize that by one word: influence. Peter: [00:27:36] Hahaha. Influence. Exactly. I’ll let you go yes please. Eddie: [00:27:43] It’s not about the title. And so often we confuse having a certain title with being a leader, but we might all agree that I can be the president, I can be the manager, I can be the director, and really be a bad leader. Right. Eddie: [00:28:01] But on the other side, I can not have that title at all and because of my level of influence in an organization, I can rise to assume those titles. In fact, it might be argued you are a leader before you actually receive those titles, and the power and authority that go with it. And what true leaders realize is if they use their influence properly, they would have to point you to a title a lot less. Peter: [00:28:31] I love that. I love that piece. And the reason– I assume you know why the reason I kind of bust out laughing when you said influence is because both of us were members of the National Speakers Association, our annual convention is titled influence. Eddie: [00:29:07] Yes, my first Influence, I joined in November 2014, joined the organization. And so Influence ’15 was my first. And I thought that when I saw the title what we call the conference and then I realized it was just that year. That’s an ongoing series. Well how cool is that? Peter: [00:29:24] So what was your what was your first convention? Peter: [00:29:29] What city was that? Eddie: [00:29:31] That was in Washington D.C..
Eddie: [00:29:33] The Waterman I believe yes. Peter: [00:29:35] Right. So I became a member in 13. And my first conference was in Philadelphia and we hadn’t changed the name at that point in time, they were in discussion process. Eddie: [00:29:49] Well I’ve gone to– well I could say I’ve gone to everyone since I’ve joined, which is only now been three official years, but I missed last years because when I looked at the schedule, I inadvertently– the way the apple counter laid out, I got it wrong, but I couldn’t change it because I decided to get married on 7/7/17 and couldn’t convince my wife to move it from Cabo, Mexico to Disneyland, where we were holding Influence..
Peter: [00:30:16] I hope you didn’t go through a long conversation trying to influence her to change it. Eddie: [00:30:21] I did try to influence her – Peter I did! Obviously I need to work on my influencing skills. Eddie: [00:31:39] Wow. That was so nice. That’s outstanding. And what a humane thing to do as well as being a kind thing to do. Eddie: [00:32:58] Yeah. Gratitude is clearly an area that leaders manifest. And I certainly would like to concur with you on what you mentioned there the point about Simon Sinek and that’s something that he talks about, the idea of influencing people and being able to use gratitude as one way of doing that. I think the very first time that I was taught about influence – in fact I know – was about 2001, when I still worked for General Electric. There was a whole course of influencing and that was the first time that that came to my attention, the power of influence. I later would say the best indoctrination I got outside of that course was my opportunity to study at the Harvard Kennedy School under Dr. Ron Heifetz. Ronald Heifetz is one of the preeminent leadership scholars in the world and his whole concept about the difference between influence and authority and adaptive leadership was something that really impacted me. It has been one of the most transformational aspects of my life. Peter: [00:34:01] Wow I forgot that you went to that small community college just outside of Boston. I forgot about that. Peter: [00:34:10] But yeah. And I think the other part of this leadership is the ability to do what your mother said to you many years ago: you have two ears or one mouth for a reason. We have not become listeners. We have we have lost the art or the science of listening and we need to get it back because we’re missing out on a lot. If we don’t take the time, park our agendas, and just listen to what the other person says or is trying to say, and have empathy for them and put ourselves in their shoes to gain a better understanding. Eddie: [00:34:52] I agree with you Peter. In fact. At the heart of coaching is the skill of listening, and I say the skill because to your point, it is something that we have lost in so many aspects of our society. And in some ways I’m not sure that our mothers aren’t teaching us that mom did teach and we have stopped using that skill, that muscle, and we don’t use that muscle atrophy, it’s atrophied. So we need to think about what it means to listen. I actually teach a coaching program, a certificate program, for the Association of Talent Development. And I walk through the four different phases of listening and challenge each person and we do a little exercise. At which level are you when you’re speaking? I’m sorry– when someone is speaking to you, are you really listening? And in so many areas, if we just were to turn on YouTube and look at our local news clip, we see people shouting at each other, shouting across each other, and there really isn’t the the listening to the words. And as a coach, we’re concerned about just not the words that are said but the words that are unsaid, and sometimes the meaning behind what was really said. And then we’re talking about looking at a person’s body language, we’re listening to their tone, we’re looking at their facial expressions and brain at all in. And I don’t believe you have to be a coach to really do that. I should be able to look at you and understand if you’re in pain, and to your point, turn on my empathy. And I define empathy as I read about in a Greek publication at one point, the original Greek language has to how we would perceive that word in English. And that is “Your pain in my heart.” If I can really feel your pain in my heart, I’m not going to just say OK have a nice day. I’m actually going to be moved to do something about that to the extent that I can. So listening and empathy I believe are definitely two qualities of leaders. And specifically, I would say as an emotional intelligence practitioner of leaders who have a high EQ, as opposed to a high IQ. So emotionally intelligent leaders understand and use empathy, and they know how to listen well. Peter: [00:37:23] I agree. And I think it’s lost– the corporate culture out there I think is part of the reason why we’ve forgotten how to listen, that we’ve forgotten how to empathize, and it’s somewhat become stale, and it’s disappointing because we can accomplish so much more just by taking the time to listen and empathize. And my transformation, what changed my– because I was a terrible listener, Eddie. Eddie: [00:37:57] I don’t believe that Peter. Peter: [00:37:58] Growing up and even even in early adulthood. But it wasn’t until I discovered improv and discovered that the principles of improvisation, which one of the key features is having respect for the other person and the ability to listen, to become a better listener, that makes me work on it every single day. And I’ve learned so much more by keeping my mouth quiet and listening. Like today I’ve learned a lot from you. Eddie: [00:38:32] Well Peter it’s been a mutually beneficial exchange. I’ve learnt a lot from you and looking at your career and looking at just how you conduct yourself and all the things you’re accomplishing. So I’m in awe, especially as a member of the National Speakers Association. The things that you’re doing, and congratulations on the upcoming presidency, you’re leading one of our great chapters there are Ohio. Peter: [00:38:55] I’m looking forward to that challenge. I woke up one day and said you know you’re the new president elect. I went Oh thank you. What what what what does that mean now? But I I am looking forward to it and I will say that, by taking that leadership role within that chapter, I didn’t realize what it was going to open me up to. And they NSA has a chapter leader Institute where President elects go, and you’re amongst your peers from around the country. All of a sudden, my NSA network has exploded and the knowledge that I’m getting from my new colleagues around the country. Yeah just that networking and that information that I’m able to get has just been wonderful. Eddie: [00:39:58] That’s fantastic. Yes the chapter of the institute is quite the organization, quite the opportunity to develop, and I have not had that privilege of going. But everyone who has attended I’ve spoken to speaks as glowlingly as you do. I am so excited for you. Peter: [00:40:15] Yeah. I did. I had no expectation and I walked into this thing and was just completely blown away. And this goes to the kind of the point of leadership because there are opportunities out in the community to become better leaders, to learn how to become a better leader, and it’s by getting involved. It’s by you know joining the rotary, joining the National Speakers Association, joining the Ohio society of CPAs. That’s where I get a lot of my leadership, being on the board and being chair of the executive board. And we can’t do that without putting ourselves out, becoming vulnerable, getting outside of our comfort zone in order to become better at what we do. And I’ll kind of wrap my piece of this up this is if we take a course in leadership, it doesn’t make us a leader. We have to practice it every single day, and we have to get exposure to a lot of other leaders to help mold our leadership model. Eddie: [00:41:20] I agree. I am, like you, I have been trained in leadership and I am a leadership practitioner. In fact my moniker is the leadership accelerator because of the work I’ve done with helping leadership accelerate the performance and drive impact. But in spite of all my leadership studies and training and certificates and certification, this year I am the president of the Association for Talent development in Houston. Eddie: [00:41:49] Thank you. I must tell you that everything I’ve ever read in a book is certainly being challenged, and as Professor Heifetz would say, I am reaching the premier portion of my of my competence, the frontier of my competence is being challenged. It’s in the new way. It’s one of the largest chapters that ATD has. We’ve got about 400 people almost in our chapter. And so to pull all that together with our existing board, it is definitely a growth in a different way because it’s different from a corporation. In a corporation, people have a different motivation for following a structure. Eddie: [00:42:31] When you’re running an organization where they’re all volunteers, definitely influencing becomes more important there Peter. And so I love the fact that we have had– I benefited from ACD having a meeting once a year for for all chapter leaders. So everyone on board gets to go to DC where we’re headquartered and be trained at the national level for your position. Whether you’re the vice president of membership, the vice president of programming, you get to meet with your colleagues across the country. So you have a built in network to support you throughout the year. And so I’ve benefited from that as being among the poor for the last four years in a different capacity. And of course now culminating with the presidency. So I would concur with you that sometimes we might discount how we can develop as leaders in the local community. But I am clearly saying that I’m benefiting and also being challenged in a way that I did not anticipate. And so I think that what I am learning in these community roles is as applicable in a corporate role, perhaps even more so. Again, when you’re challenged to influence a large group of people with whom you do not have a paycheck that you’re giving or vacation time or a benefits package. Right. It requires a far more level of leadership from you as an individual. So I would encourage people to definitely take advantage of joining those organizations and assuming leadership, as they can. Peter: [00:44:01] Well said my friend, well said. Because yeah when you get a volunteer organization that you’re trying to lead, there’s a different mindset there and you have to be inspiring and you have to reengage and you have to be facilitating. You have to have so much energy to keep everybody as equally as jazzed as you are to get things done and move and move forward. If somebody wants to contact you, how can they find you? Eddie: [00:44:31] Well I’m across all the major social media networks. I am Eddie Turner, and my website is EddieTurnerLLC.com. Peter: [00:44:49] Once again thank you so very much for spending some time with me. I thoroughly enjoyed our conversation. I’m looking forward to seeing you at Influence 2018. And actually I might actually be in the Houston area in May, and if it’s confirmed I will let you know maybe I can take you out to dinner for spending time with me today on my podcast. Eddie: [00:45:09] Well Peter it’s been an absolute pleasure to be here with you today. Thank you for the invitation. I’m excited that I was able to meet with you, and if you come to Houston, it is my obligation to show you good old southern hospitality so I won’t even hear of you buying dinner. It’s on me. We’re going to get together. Have a good time and we’ll get you some good old Texas cuisine. Peter: [00:45:32] I want to take you up on that. Thank you so very much. Eddie: [00:45:35] Take care Peter. Thank you. 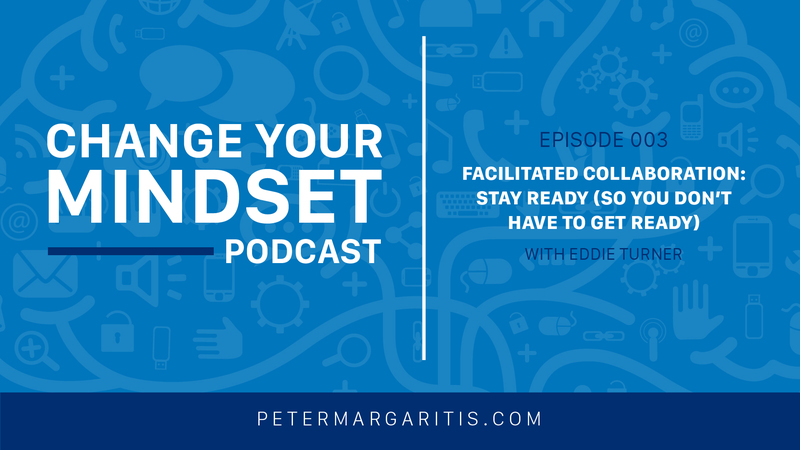 Peter: [00:45:38] I would like to thank Eddie for sharing his thoughts and perspectives about today’s senior leadership challenges with change management and engaging their teams. In Episode 4, My guest is Dr. John Mollidor, who is a professor and community assistant dean at Michigan State University College of Human Medicine and the past president of the National Speakers Association board of directors. 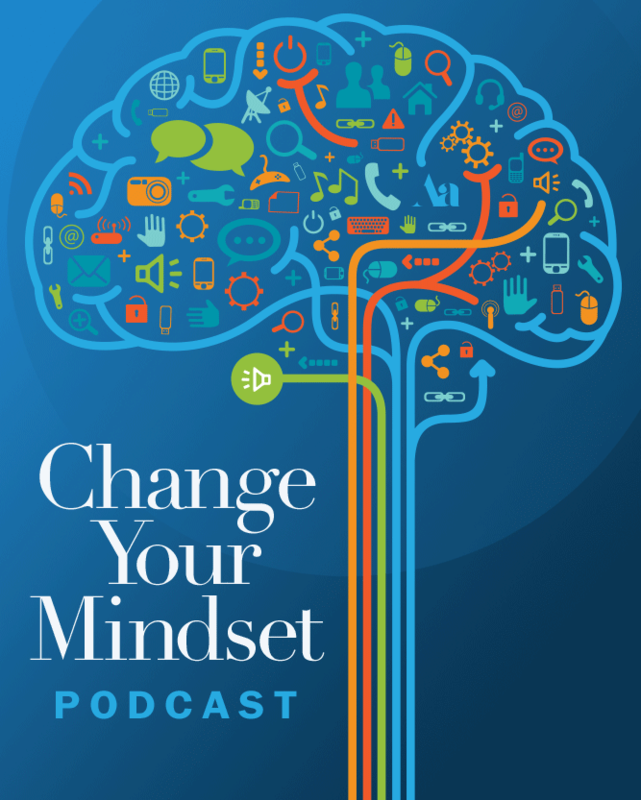 Thank you for listening and begin the process of changing your mindset and getting out of your comfort zone and developing a new skill set to become a more future ready professional. Remember this is a process that requires daily application with a big dose of applied improvisation.